Recently this year, Fujifilm has released its new Instax SQ 10 camera with a new square version of the Instax film (Square film) and now it represents the first square-format mobile printer that uses this kind of film. The Instax Share SP-3 is the improved 3rd version of the brand’s photo printers and is specially designed to print photos from a smartphone and Instagram (and other social media) accounts. The gadget also works with the Fujifilm digital cameras and provides excellent quality of the output together with advanced capabilities of editing photos (e.g. different templates and filters including Fujifilm intelligence filter—an optimum processing technology). The SP-3 is a sleek compact photo printer with the size of 116 x 130.5 x 44.4 mm which produces photos 62 x 62 mm with the resolution of 318 dpi. A battery charge allows to print about 160 prints. A free Android and iOS Instax Share app allows to connect wirelessly and gives straight access to Instagram and an option to choose a photo by hashtag (what is convenient when different users post photos under a particular hashtag). 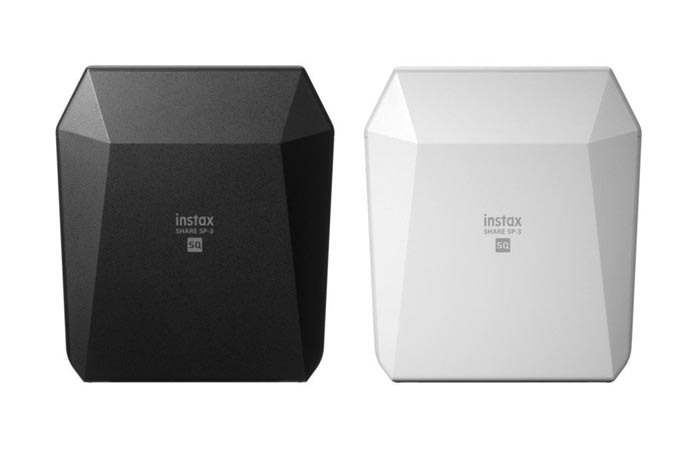 The Instax Share SP-3 will be on the shelves on November 2017 for $199 and the Square film is available for $14 for a pack of 10 sheets. This entry was posted on Tuesday, October 24th, 2017 at 11:19 am	and is filed under Fuji, photo, portable. "Cubibot—An Affordable 3D Printer For Everyone"
"Xerox MFPs For Large Workgroups"